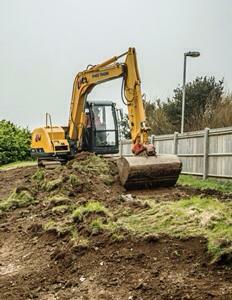 Building work to restore the Saltdean Lido has started this week with the arrival of diggers on site. But sadly, it will no longer be opening this summer because work to patch up the main pool before it’s properly restored will cost too much. The Saltdean Lido Community Interest Company, which runs the pool, said: “Builders will be on-site mid April building the brand new plant room to service the main pool, kids paddling pool and new wet play area. “However, we won’t be opening this summer, as planned. We know this is is disappointing – for us too – but there is a reason and of course it’s to do with the bad state of the existing pool – and money. “In a nutshell, as part of the £2.3 million funding we recently announced, the 2 existing pools will be put back into one and a new tank built for a 40 metre pool. Saltdean Lido has been given two grants this year, one of £2.3million from the Coastal Communities Fund and another £4.7million from the Heritage Lottery Fund, to help restore and reopen the Grade II* listed lido to the public. The CIC plans to use the money to transform the site into a modern leisure destination providing the local community with a heated outdoor pool, indoor and outdoor play areas, café, gym, community and function rooms, and a revived library. However, there is still another £2 million to raise to fund the project and so the CIC will be issuing a Community Share Scheme similar to that undertaken by Hastings Pier last year which raised £600,000. The lido was taken over by the CIC after it fell into disrepair then became the first building to be listed as an asset of community value by Brighton and Hove City Council. If an ACV is put on the market, the community is given six months to put together a bid to buy and run it. The Rose Hill Tavern in Brighton, which is the second building to become an ACV, was put on the market last week, allowing campaigners to do the same. And building work at another Brighton pub, the Horse and Groom, stopped this week after it became the city’s third ACV.